This tip is definitely for the intermediate marketers out there. There are constantly, yes I mean constantly, offers circling around the major networks that offer huge bonuses to the top performing affiliates. They’re contests, and if you focus and work towards a clear goal, winning the top prize might be easier than you think. Whether it’s a new product launch or an existing service trying to drastically boost its user base, many companies are willing to offer a double incentive for affiliates to promote their offers. 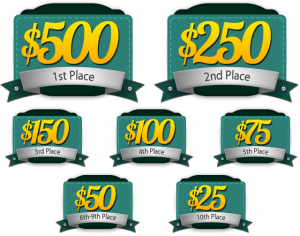 In addition to the “normal” commission structured into the original offer (and which is usually available all the time, with few restrictions), many programs will offer contests to spur competition among affiliates and increase the number of affiliate promoting their product. Usually, there are prizes for at least the top 3, and often the top 10 affiliates who make the most sales, within a predetermined timeframe. That means you don’t even have to win in order to benefit from the contest. If you can grab the first or second spot, though, the rewards can be very lucrative. Plenty of contests pay out with thousands of dollars in bonuses, which can even double the amount you earned from the original offer! It works because even though the company might “lose” money by paying the top affiliate, the attention it generates among other marketers generally brings about a sizable boost not just in sales, but also in the number of affiliate promoting the offer, which can lead to long term returns for the company as well. The best places to find these offers are the CPA-networks. Neverblue, MaxBounty, Peerfly, etc. Offers are constantly coming and going, so you’ll almost always be able to find one contest live on each of the major networks. The other point to note is that many of the networks offer “sign on” bonuses to new affiliates. if you join a new network and make X dollars in sales in your first 30, 90, or 180 days, you might qualify for a performance incentive, but we’ll get more to that point in our next tip. With either approach, it’s a great way to boost your income. See other online marketing tips to learn more.